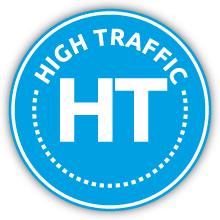 The stamp HT High Traffic is shown on the label of Solid top coatings in order to prove that they are very resistant to foot traffic. This quality is certified by Catas, the Italian research institute and test laboratory in the wood and furniture field. Solid top coatings passed the “taber test”, a test in compliance with the norm UNI EN 15185:2011 that certifies the resistance to scraping. Relationship status: high traffic surfaces are in love with Solid coatings.